This is used to treat either patients requiring grafts to bypass narrowings in coronary arteries, or valve surgery, or both. Please read the section on heart valves first. If surgery is considered as the definitive treatment for valvular disease, certain points need to be borne in mind. First, the timing of surgery is crucial. Patients may have their valvular conditions monitored by echocardiography for years before surgery is indicated. But certainly, any development of symptoms such as breathlessness or dizziness etc. would bring surgery forward. Certainly if symptoms were to develop before the next review date, then an earlier appointment should be expedited. For arterial grafts, please see the section on “Coronary Artery Disease” first. With any valvular condition, exposure to blood borne infection is detrimental. Blood infections tend to target narrow or leaky valves in particular. This can result in endocarditis, where the valve can become destroyed with adverse clinical consequences. Extra care needs to be taken in patients having valve surgery as artificial valves are particularly susceptible to infection. Before any valve surgery, full dental assessment is thus mandatory. Prior to surgical consideration, some type of surgical risk assessment is made. The surgeon would discuss whether any other co-existing medical conditions would contribute to the risk of the procedure. Hopefully this does not apply, and the benefit of the procedure would outweigh the risk! 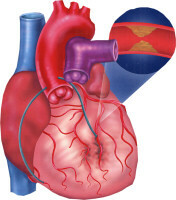 This procedure is usually undertaken to treat coronary artery narrowings surgically. In order to restore blood flow around narrowings, usually angioplasty using stents is the first consideration as a treatment strategy as it is less intrusive. However, if there are several narrowings (especially if there are narrowing affecting the three main vessels), or the specific location of a narrowing is unsuitable, then surgery is considered. In this procedure, veins from the legs are harvested at the beginning of the procedure, and applied to the heart. These graft will ‘bypass’ the narrowing by attaching to the aorta at one end and attaching to the artery just beyond the narrowing. (See picture). These are referred to as vein grafts. For the most important artery that needs grafting, the left breast artery is used and diverted a short distance from the breast, to the front of the heart. This does not affect the breast at all. The actual surgical procedure involves 5-10 days in hospital. During the operation which lasts a couple of hours, the circulation of the heart is “bypassed” by an artificial pump to substitute the hearts function. The heart can then be safely stopped and the grafts attached. The artificial pump can then be disconnected and the heart restarted. There are newer techniques that have been developed that allow for surgery to be performed on the beating heart . In addition, in most cases the chest is opened to perform the operation (hence the term open heart surgery), which will leave a scar on the front of the chest. In specific cases some operations can be performed without a major midline incision of the chest, but through a series of min-cuts. The advantage of this technique is that the recovery after surgery is much quicker. This option would be discussed with you. Clearly this is a major operation, but these days the risks are much lower (2%). After surgery, patients are mobilised within 2 days, and go home around 5-7 days. Normal complications of the procedure include postoperative infections, and small collections of fluid. Generally, the healthier the patient pre-surgery, the less the complications afterwards. That’s why patients should have stopped smoking, lost weight and optimised their blood pressures and diabetes beforehand.